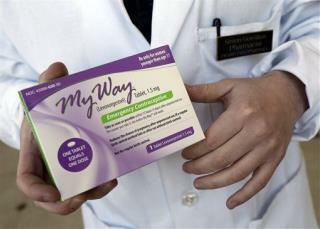 (Newser) – Morning-after birth control just got cheaper and easier to buy, NPR reports. After a 10-year battle, the FDA published a letter saying that generic versions of the popular Plan B One-Step can be sold to customers without proof of age. That overruled an FDA decision in July granting Teva Pharmaceuticals a 3-year window to sell its product over the counter without competition from generic products. (That was prompted by a federal ruling that aimed to make the drug available to all over the counter, the Boston Globe reports). But now the FDA calls that decision "too broad." The FDA should only be ruling on the safety of a substance. If it isn't dangerous to a 17 year old, or 16 year old, or 15 year old then they should be allowed to buy it without proof of age. I completely agree. The other day at the local Walgreens when I was at the pharmacy counter I looked over and noticed great big audible alarm gizmos strapped to the OTC Plan B packets. Though it's tempting to ascribe that to some conservative-inspired policy to embarrass the heck out of potential customers, I have a feeling it's just that the ridiculously high price ($59.99 if I remember correctly) makes it a shoplifting target.